The TI-84 Plus Presentation Link adapter gives students the ability to display their own work from the calculator screen to the entire class, providing a more engaging, interactive classroom learning experience. 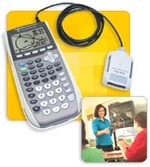 The adapter works with student TI-84 Plus Family calculators to TI's presentation tools: the TI Presenter video interface, and the Viewscreen LCD panel for use on overhead projectors. Calculator not included.